Though only a 7/8 mile oval (the smallest circuit on the 2010 IRL schedule), the IZOD IndyCar Series at the Iowa Speedway has provided enough room for some entertaining events. Receiving warm accolades for being built to the specs for modern racing, including a wide pit road and a outside retaining wall built specifically with SAFER barriers in mind, the Iowa oval is a fantastic track for multi-groove racing. Without completing a single lap, the Iowa Corn 250 fell under its first caution when the #22 car driven by Justin Wilson swept backwards up the track. Regrettably, the backward collision of Wilson caught the #32 KV Racing Technology car of Mario Moraes taking the Brazilian out of the event. Though two drivers were alright, they were also out of the event early. Disappointed for the sudden loss of control of the Dallara-Honda, Justin Wilson ended the day saying "It's obviously not how I wanted today to be and I feel sorry for everyone on the Charter car and the Dreyer & Reinbold Racing and also for Mario and his guys. He was an unfortunate bystander". Starting with some strong road course runs to the 2010 season, Justin Wilson and his Dreyer & Reinbold Racing team has found the ovals to be problematic. 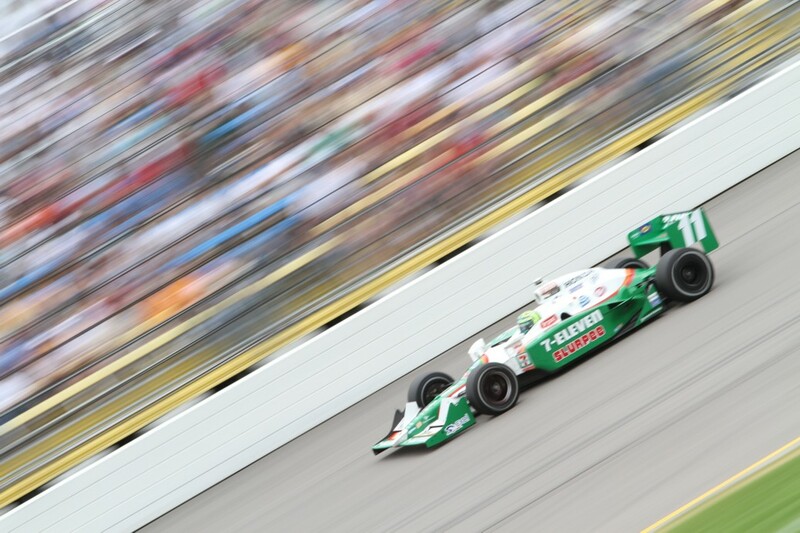 In the past 4 oval races on the IZOD IndyCar schedule Wilson had only one top 10 finish resulting in the Indy 500. Justin Wilson is definitely looking forward to the road course of Waltkins Glen not only for the before mentioned reason but because this was the race the Brit won last year. Though Penske Racing's Will Power started on the pole position, the #12 Verizon car would be spending a short time amongst the front. Leading the first 32 laps for the day, the Penske Racing car of Power will be unseated at the front by the #26 of Marco Andretti. the first lead change of the race, the front position would be swapped 16 times during the Iowa Corn 250 event. Leading the most of the 250 laps was the Target/Chip Ganassi Racing #10 of Dario Franchitti. Taking the lead on lap 45, Franchitti led until a lap 52 debris caution, the second time the yellow flew on the day so far. Most cars took the opportunity to pit with exception to the #24 Dad's Root Beer car being driven for the weekend by Graham Rahal. Initially thought by observers as a bold attempt to gain track position, Rahal would confess in post-race that his presence in the lead was a result of radio troubles. After 5 laps under green, Dario Franchitti would take the lead from Graham Rahal and the #24 Dreyer & Reinbold Racing car was required to pit lane for refueling as well as tires. Without letting Franchitti capturing on the glory for the Target/Chip Ganassi Racing team at Iowa, the #9 team car of Scott Dixon would make a competitive move on his Scottish teammate as the two Target cars swapped the lead 4 times between lap 68 to lap 116. The race was slowed again for a Sarah Fisher accident in turn 4 allowing an opportune caution where teams could pit. Restarted on lap 112 for the Iowa Corn 250, the Target/Chip Ganassi Racing cars would soon meet a very hungry and very fast Andretti Autosport #11 car hovering in their mirrors. Tony Kanaan bolted from a 15th place starting spot in just under half the race distance with credit going to teammate Ryan Hunter-Reay for aiding the Brazilian on a race setup. Making full use of his teammate's setup, Kanaan took the lead on lap 120. Having a terrific performance, the KV Racing Technology team had two cars within the top-10 of the running order led by the #5 Lotus Engineering car driven by Takuma Sato. Running incident-free for more than 75% of the Iowa Corn 250, the Japanese rookie's race ended on lap 17 8 when his #5 car swept into the turn 4 wall. Through the final pit stops for the leaders under this caution for Sato, an anxious moment developed within the Andretti Autosport team. As Kanaan was being serviced by the #11 crew members, the #37 of Ryan Hunter-Reay darted into his pit and almost made contact with the #11 team's front tire changer. The incident was a near miss as crew member was not seriously hurt and both Andretti Autosport cars were initially sent back into competition. However, IRL later summoned Ryan Hunter-Reay to pit road for a drive-through penalty for making contact with pit equipment. After the pit stop, Dario Franchitti was positioned convincingly for his 3rd win at Iowa Speedway. However, a challenge from Penske Racing's Helio Castroneves kept pressure on the Scot's #10 car. Franchitti's desire for Iowa victory ended after late in the event when his Dallara-Honda experienced gear-shifting issues regulating the 2010 Indy 500 winner into pit road and several laps down. Finishing 18th in the race, Dario Franchitti lost the overall IZOD IndyCar Series points lead falling to third as well as the AJ Foyt Oval championship points lead. With Castroneves now in the lead in his #3 car, the #11 of Tony Kanaan begin a triumphant charge back to the front. With only 10 laps remaining, the duo of the Brazilian IndyCar drivers was resolved with Kanaan streaking by Castroneves winning the Iowa Corn 250. The first win for Kanaan since Richmond of 2008, Tony Kanaan was understandably ecstatic about being in victory lane. This victory for the #11 team was also the second win of the season for Andretti Autosport signalizing that the IZOD IndyCar series could be showing signs of having three strong superteams. With Tony Kanaan's first win in about two years proving as a significant storyline, some special credit should be paid to the finish of KV Racing Technology's EJ Viso pulling out a brilliant 3rd place run. The last of the KV Racing Technology cars left in the Iowa Speedway event, the Venezuelan moved from 19th to score this personal-first podium position. As Dario Franchitti falls from the top of the 2010 IZOD IndyCar series overall points lead, Will Power retakes the lead enduring the four-race oval stretch which saw the Australian nonetheless with only an 11 point lead over Scott Dixon.